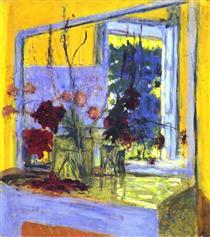 Jean-Édouard Vuillard (French: [vɥijaʁ]; 11 November 1868 – 21 June 1940) was a French painter and printmaker associated with the Nabis. Jean-Édouard Vuillard was born on 11 November 1868 in Cuiseaux (Saône-et-Loire), where he spent his youth; in 1878 his family moved to Paris. 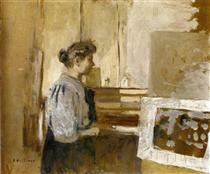 Vuillard's father, a retired army captain, was 27 years older than his mother Marie Vuillard (née Michaud). 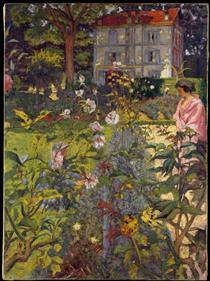 After his father's death in 1884, Vuillard received a scholarship to continue his education. 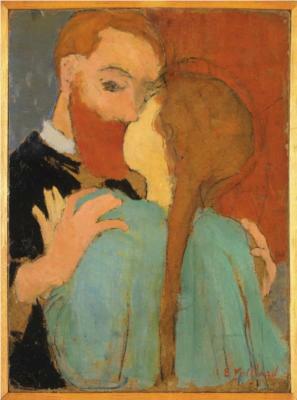 In the Lycée Condorcet Vuillard met Ker Xavier Roussel (also a future painter and Vuillard's future brother in law), Maurice Denis, musician Pierre Hermant, writer Pierre Véber, and Lugné-Poe. 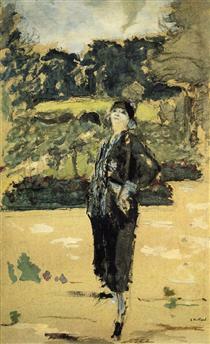 In 1885, Vuillard left the Lycée Condorcet. On the advice of his closest friend, Roussel, he refused a military career and joined Roussel at the studio of painter Diogène Maillart. 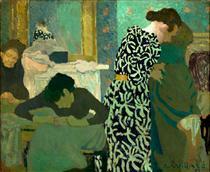 There, Roussel and Vuillard received the rudiments of artistic training. From 1886 to 1888, he studied at the Académie Julian. 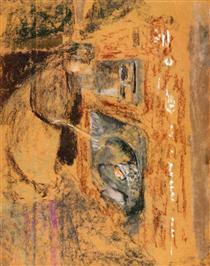 In 1887, after three unsuccessful attempts, Vuillard passed the entrance examination for the École des Beaux-Arts. 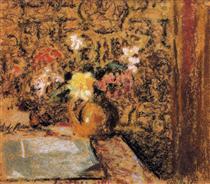 Vuillard kept a private journal from 1888–1905 and later from 1907–1940. By 1890, the year in which Vuillard met Pierre Bonnard and Paul Sérusier, he had joined the Nabis, a group of art students inspired by the synthetism of Gauguin. 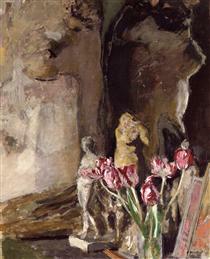 He contributed to their exhibitions at the Gallery of Le Barc de Boutteville, and later shared a studio with fellow Nabis Bonnard and Maurice Denis. 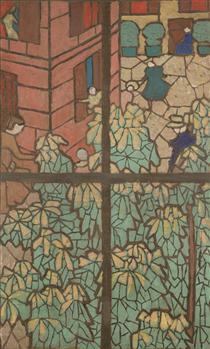 In the early 1890s, he worked for the Théâtre de l'Œuvre of Lugné-Poe designing settings and programs. 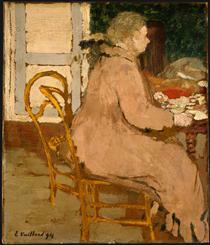 In 1898 Vuillard visited Venice and Florence. The following year he made a trip to London. Later he went to Milan, Venice and Spain. 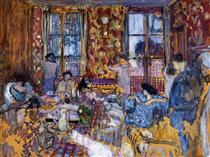 Vuillard also traveled in Brittany and Normandy. 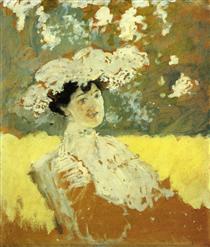 Vuillard first exhibited at the Salon des Indépendants of 1901 and at the Salon d'Automne in 1903. 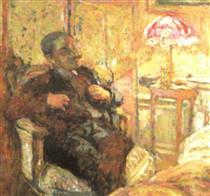 In the 1890s Vuillard met the brothers Alexandre and Thadée Natanson, the founders of La Revue Blanche, a cultural review. Vuillardʹs graphics appeared in the journal, together with Pierre Bonnard, Henri de Toulouse-Lautrec, Félix Vallotton and others. 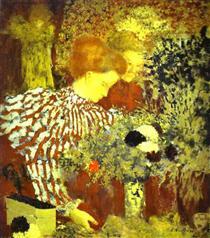 In 1892, on the advice of the Natanson brothers, Vuillard painted his first decorations ("apartment frescoes") for the house of Mme Desmarais. Subsequently he fulfilled many other commissions of this kind: in 1894 for Alexandre Natanson, in 1898 for Claude Anet, in 1908 for Bernstein, and in 1913 for Bernheim and for the Théâtre des Champs-Élysées. 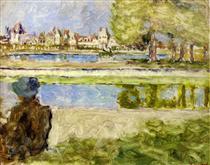 The last commissions he received date to 1937 (Palais de Chaillot in Paris, with Bonnard) and 1939 (Palais des Nations in Geneva, with Denis, Roussel and Chastel). 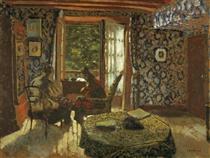 In his paintings and decorative pieces, Vuillard depicted mostly interiors, streets, and gardens. Marked by a gentle humor, they are executed in the delicate range of soft, blurred colors characteristic of his art. 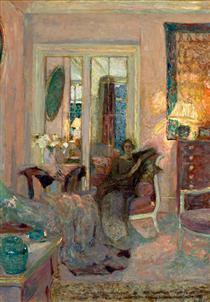 Living with his mother, a dressmaker, until the age of sixty, Vuillard was very familiar with interior and domestic spaces. Much of his art reflected this influence, largely decorative and often depicting very intricate patterns. 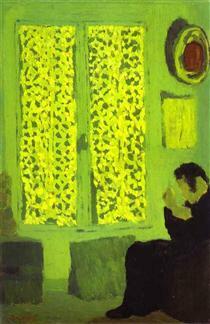 The Green Interior or Figure in front of a Window with Drawn Edouard Vuillard ?